Mass immigration is the major cause of our rapid population increase. It is estimated that net migration plus births to foreign-born parents has accounted for 85% of UK population growth since 2000. Official projections show that 60% of this 8 million increase will be down to future migration. Since 2000 the population of the UK has increased at a faster rate than any time in the previous 90 years. Unlike previous episodes of growth, the major reason for this increase is the high level of immigration. The population growth of a country is affected by the birth rate, the death rate and net migration. The difference between the number of births and deaths is known as natural change. If net migration is positive then immigration is greater than emigration. Positive net migration adds to the population both directly from the migrant themselves and indirectly on natural change by increasing the number of births in the country. In 2014, 27% of all births in England and Wales were to foreign born mothers. In 2001 the population of the UK was estimated to be 59.1 million with 4.9 million (8.3%) foreign born. In 2011 the population of the UK had increased by 4.1 million to 63.2 million with the foreign born population at 8 million (12.6%). In 2015, the population of the UK is estimated to be around 65 million. It is estimated that net migration plus births to foreign-born parents has accounted for 85% of population growth since 2000. England is already one of the most overcrowded countries in the world. Over 90% of international migrants to the UK go to England. England has a population density of 410 people per square km. Excluding island states and city states like Singapore, this makes England the eighth most crowded country in the world, just behind India and nearly twice as crowded as Germany and 3.5 times as crowded as France. If net migration continues at current levels the UK will become ever more crowded. Projections of future population growth have to make assumptions about net migration, birth rates and mortality but in the UK, net migration at recent levels is by far the largest driver of population growth. The total fertility rate (TFR) is often used to represent the ‘birth rate’ of a population. It is the average number of children that the average woman would have if the fertility patterns of any given year were to continue over her reproductive years. In the last forty years TFR has remained fairly stable, between 1.7 and 1.9. Today the TFR is around 1.83. A TFR of 2.1 is required to replace the population in the long run. The UK population is ageing as the birth rate has fallen since the last century and as life expectancy increases. This means that the ratio of people of working age to retired people is declining (assuming working age remains fixed at 16-64). Some try to claim that as a result more working age migrants are needed to fund the cost of caring for people in their old age. While immigration can moderate population ageing in the short term, the effect is not strong and migration cannot offer a solution to population ageing. Migrants also grow old and need to be replaced by an ever increasing flow of immigrants to have any major effect on the age structure of the UK, leading to substantial increase of the population potentially without end. 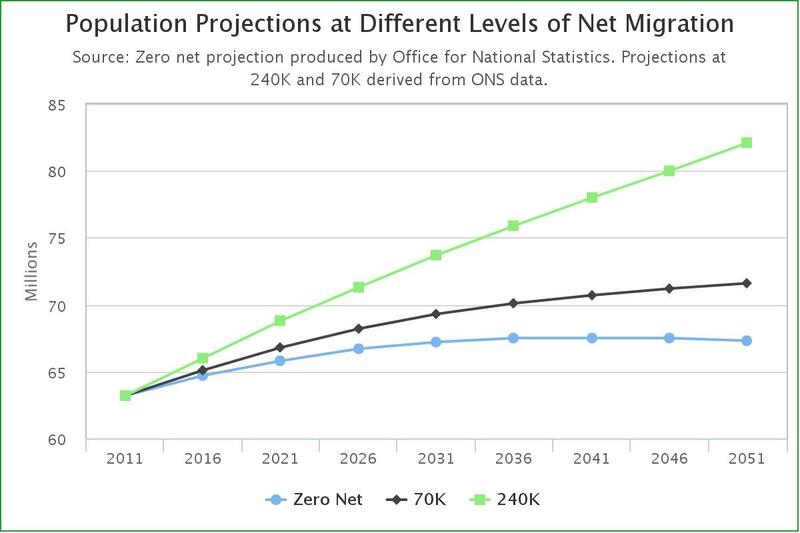 The Office for National Statistics produces projections at different levels of net migration. This allows for an estimate of the impact of future migration on population growth. The UK population is currently around 65 million. If net migration were reduced to zero (that is, the number of people entering and leaving the country were the same) the population would rise gradually to 67 million in fifteen years time, peaking at 67.5 million around mid-century before gradually declining. By contrast, if net migration continues at the rate of 240,000 immigrants per year (the average of the last 10 years), then the population is projected to rise by 2.5 million over the next five years and to reach 73 million in the next 15 years. This is an increase of 8 million people, the equivalent of adding the combined population of Greater Manchester and the cities of Birmingham, Glasgow, Liverpool, Leicester, Leeds, Sheffield, Bradford, Nottingham, Portsmouth and Bristol. How can this possibly be sensible? 60% of this increase would be from future migration. The population growth would not stop there. It would continue to soar, reaching nearly 80 million in 25 years and keep going upwards. These projections are illustrated below. Figure 1. Population Projections at different levels of net migration. Such rapid population growth has severe impacts on the provision of public services such as school places. Similar strains will be placed on infrastructure like the transport network. Roads will have to be widened and new ones built to deal with the extra traffic while overcrowding on the railways will increase. Adequate housing will have to be built to accommodate all the extra people, either by making our urban areas more overcrowded or by building on green field sites with the loss of valuable amenities like beautiful countryside and productive farmland. The UK has a finite amount of land. Continued high levels of immigration mean accommodating more and more people on this land. No UK government has had a population policy but the present government does have a target of reducing net migration to the tens of thousands. This would significantly slow the rate of population increase. Thanks for that, Migration Watch. Now, bear in mind that for as long as the UK remains a member of the European Union, we – that’s you and me, the citizens of the UK, and our political ‘elite’ – can’t actually control this rate of UK population growth; not significantly so, anyway. The British Government’s policy of reducing net migration to the tens of thousands is self-evidently a joke; some would even say it’s hysterical. By and large, the size and shape of our society is nowadays all decided and imposed upon us by thousands of unelected, unaccountable bureaucrats who spend their extraordinarily well paid days in a palace in Brussels called the European Commission. To me, it all feels rather medieval living under this form of feudalistic style of governance whilst watching and, moreover, experiencing our country bursting at the seams. Migration watch have been informing the UK population for years and it still continues. It only exists to try and attempt to defuse the situation in the population whilst the elites carry on as is. A little thing about Keynes once you factor in migration as economic growth like the ONS states then it can no longer be removed… 2% YOY yet Cameron has stated he will never give up Keynes. Join the dots the Tories and Cameron will never give up immigration, a part of Keynes. Somebody should point out to these Politically Correct, Multicultural lunatics, that as the populations of Africa and Asia are growing at somewhere between forty and eighty million per year and rising exponentially. We could flood Europe, Australia and NZ with immigrants and the population of these Third World countries would still be growing at an unsustainable rate. We can’t help the Third World by allowing mass immigration, this will very soon drag us down to their level and has already happened to a certain extent. As if that’s not bad enough, I was just reading an article at the Gatestone Institute, that says that by 2017: there will be more young Muslim men of military, fighting age in Germany as there are Germans of that age. These people won’t integrate, are not our friends and probably never will be: they hate us and just want our countries. We as Europeans, are literally committing suicide. I’ve spent my life travelling, having lived in Africa, Asia and South America: I’m not as naive as many of the ‘Do Gooders,’ that espouse the benefits of mass immigration. I’ve witnessed the poverty, violence and prostitution of the Third World at first hand for too long. In the fanatical pursuit of globalisation by a few self interested people, many have been conned into believing that we can carry the weight of the World on our shoulders: we can’t. As for the European Union: after many years of political and financial disaster and failure, this organisation has dramatically failed upon the first challenge to our borders. The EU may break up, but we’re going to be left with an incredible trail of destruction in its wake. It’s already a bit late for us to avoid this mess by leaving the EU: but better late than never. When everyone else, it seems, has first hand experience of rising congestion, pressure on housing and public services, our politicians appear oblivious. Or as you say, are they? Perhaps living a privileged life of first class rail, subsidised housing and personal assistants has dulled their senses and genuinely they have no idea of what is happening to everyday life. Maybe they have become too focused on the damned GDP figures and concept of growth at all costs. The lazy mans way to grow the economy, is to grow the population. Simple. Makes their economic tenure look clever and successful but they have forgotten about the collateral effects. Perhaps we all have to accept static or even falling incomes, in return for preserving real living standards. Farage recently hinted at this and he is probably right. I’m no conspiracy theorist MM, but in answer to your (rhetorical?) question above: “are our politicians doing this deliberately?” then ‘Agenda 21’ may be the answer. If not, then they are doing it by accident and are thus incompetent and/or stupid. I recall reading ‘Only One Earth’ in 1972 (Rene Dubos). It’s title is self-explanatory and discussed why one couldn’t expect to fit a quart into a pint pot. We appear to attempting to fit a gallon in now. Our children (our two are 24 and 20) have never and will never experience anything like our freedom of self-expression and quality of life of the 50s and 60s. As a pragmatist, I take some small comfort from the fact that they are thus to some extent inured to the parlous state we now find ourselves in. If that sounds like pragmatism taken to the tipping point of defeatism, it may be so. After all, we ‘ran away’ from Blair’s Britain 15 years in an effort to escape it. An interesting take on the situation, Robert. Thanks. An excellent article with lots of interesting (and worrying) statistics. And a valid conclusion in the final paragraph. How did we get into this mess? More to the point, how do we get out of it, short of civil unrest? Certainly not Cameron’s pathetic renegotiation, shifting deckchairs on the Titanic. Yes, I’m always slightly wary of raising the old ‘this could lead to civil unrest’ card; it usually sounds a trifle over the top, especially when one considers the cultural and traditional tolerance of us Brits. However, these days I do think that our politicians are carefully (or recklessly?) assembling one hell of a societal powder keg at the moment. The questions for me are (a) are our politicians doing this deliberately? (b) if so, why? (c) if not, when and how do they intend to arrest the immigration trend? (d) does the political class think that it has the nation’s support for ignoring the migration writing on the wall? (e) if not, what do they intend to do about it? (f) if so, standby for civil unrest in the fullness of time. The figures are all the more disturbing when you bear in mind the current population is actually around 85m (the big 4 supermarkets estimated it at 77m in 2007) so in reality we’re actually going to be probably nearer 95-100m in 15yrs. Yes, that’s a fair point. 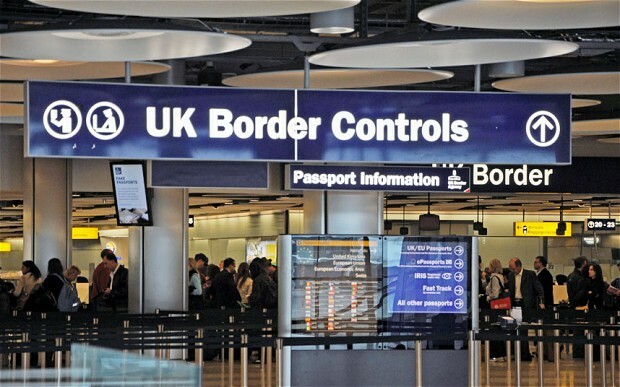 There are ‘official’ population statistics and then there is the additional margin of population, existing in the shadows of our society, about which we know little or nothing – thanks largely to the shocking deterioration in the UK’s border controls in recent years. As usual, and as I bang on about endlessly, much of the appalling portents for our society can be attributed to the bizarre and unwarranted behaviour of the British political class and Establishment for the past half-generation or so. There are days when I really do wonder what on earth moved our politicians to start engineering such an unholy societal mess 2 or 3 decades ago? And they’re still getting away with it, but I’m also beginning to wonder if they’ve at last been rumbled? I hope so, I really do. The most disturbing aspect of all is that the cultural habits of a large percentage of ‘incomers’ are not compatible with British culture and they have no intention of integrating. As we have seen, this does not only apply to first generation immigrants, but second and third as well. “East is East, and West is West, and never the twain shall meet”, as Kipling said, and forcefully pushing the two together will not end well. The main problem is not merely the growth in population (although that is worrying enough) but the breakdown of British social cohesion, cohesion that has served us well for centuries past.